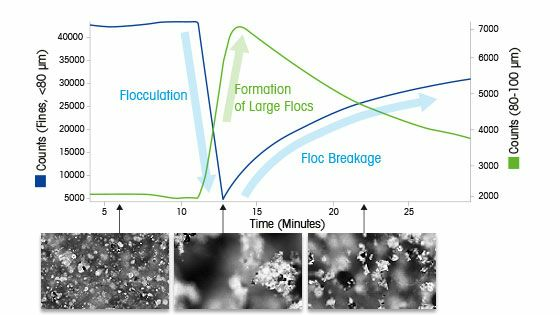 Flocculation is a two-step particle aggregation process in which a large number of small particles form a small number large flocs. 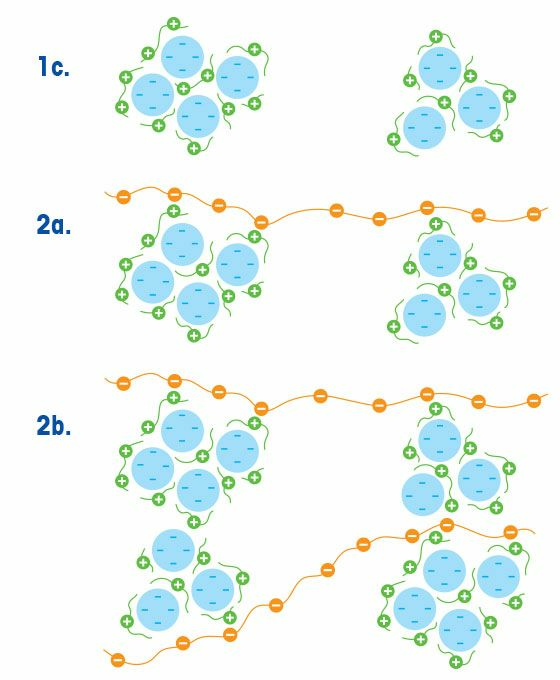 Small particles usually carry negative surface charges that hinder aggregation and settling (1a). Coagulant chemicals can adsorb to the particles and balance the charges. The introduction of opposite charges enables particles sticking together to form stable and well suspended submicron flocs (1b). Rapid mixing is required for proper dispersion of coagulant chemicals, to promote particle collisions and submicron floc formation (1c). Flocculation requires gentle mixing and the use of a high molecular weight polymeric flocculant. The flocculant adsorbs to the submicron flocs and facilitates bridging of gaps between flocs (2a). 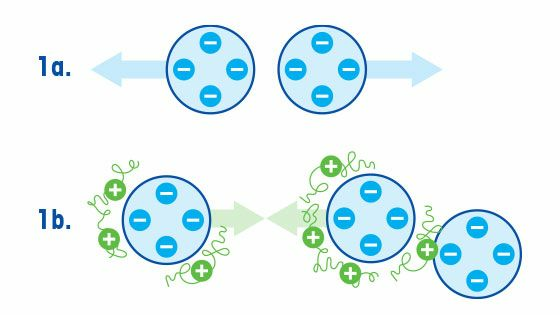 Brining particles closer together creates the effective range for Van Der Waals attraction forces to reduce the energy barrier for flocculation and loosely packed flocs form. Aggregation, binding and strengthening of flocs occurs until visibly suspended macroflocs form (2b). At the right weight, size and strength sedimentation occurs. Macroflocs are very sensitive to mixing and once torn apart by strong shear it is difficult or impossible for them to reform. Flocculation happens naturally during the formation of snowflakes or subsea sediments but it is also deliberately applied in the biotechnology, petroleum, pulp and paper, and mining industries. Cell disruption can create lots of small cell fragments which clog filters and slow down filtration rates. Flocculation is used to aggregate these small cell fragments. 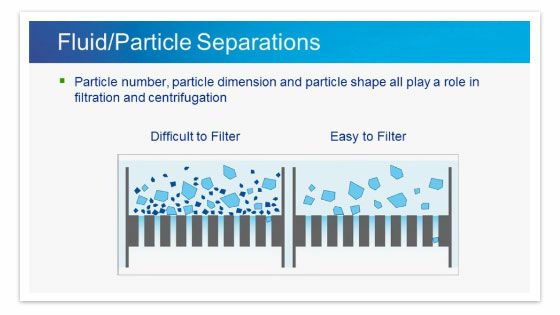 Applying flocculation ensures a high flux over filtration units as well as efficient and cost effective separation of cell material from supernatant. Used water can contain significant amounts of suspended particulate matter, which often takes long to sediment. Flocculation expedites sedimentation and ensures efficient solid/liquid separation. Large volumes of used water can be process quickly which minimizes the environmental impact in the sense of land needed for used water storage facilities. Cellulose fibers is one of the main ingredient in pulp and paper but it also requires glue, impregnation and fillers to achieve the required sheet properties for an acceptable paper product. Flocculation is the key processing step to combine fibers, fillers and other additives in such a way that it dewaters quickly and can be produced in large quantity. Product streams often contain a wide range of different metals, which need to be separated in order to obtain a pure product. Selective precipitation of individual metals is usually accompanied by flocculation and sedimentation to ensure quick separation from the remaining liquid. Flocculation is an important unit operation, which needs to be developed and optimized to run cost effectively. Whether the objective is to flocculate cells fragments, suspended particle matter, fibers & fillers or precious metals, the steps to develop efficient flocculation processes are very similar. 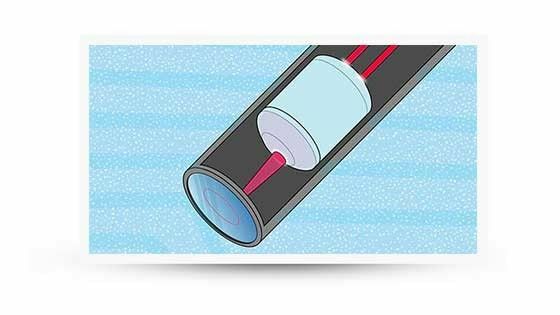 In the fiber-cement industry, it is key to understand flocculation particle mechanisms along the process. ParticleTrack trends in individual size classes and in situ ParticleView images show a large number of small particles and a small number of large particles stirred at steady state. 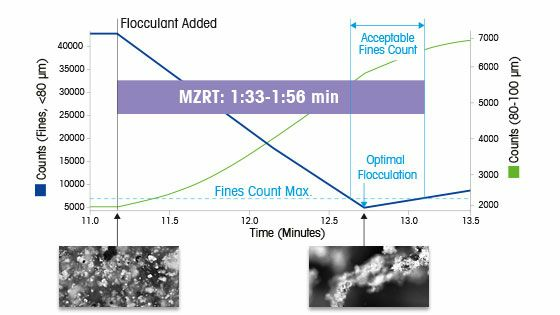 When the flocculant is added, the number of fines drops dramatically and the number of large flocs increases significantly. Beyond the point of optimal flocculation the shear of the stirrer starts to destroy the flocs, large counts decrease and small counts increase again. Understanding flocculation particle mechanisms helps to identify root causes of suboptimal process performance, downstream production challenges and out of specification products. Detailed in situ particle data is the first step to effective process optimization, Quality by Design and efficient manufacturing. Flocculation requires gentle stirring. As individual floc types have different strengths, it is particularly important to understand what stirrer rpm is gentle for a specific floc system. ParticleTrack trends for small particles indicate how the small-size class changes when flocs are created and stirred at different rpm. Fast stirring breaks a lot of flocs and the number of fines almost reaches the same level as before flocculation. Slow stirring leaves most flocs intact and can be considered gentle. In situ ParticleView images support these findings and show larger flocs at low rpm. Mixing intensity and shear optimization is a successful strategy to prevent floc breakage. 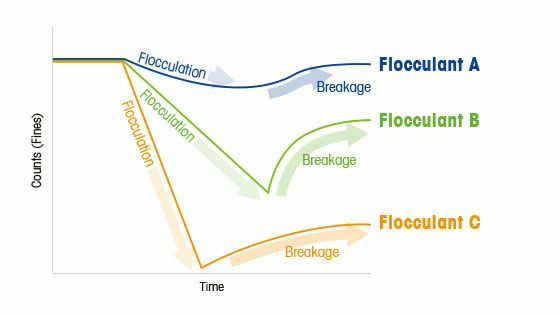 Breaking flocs defeats the purpose of flocculation, increases filtration times, and should be avoided. Filtration rates and cake dewatering are the quickest at the point of optimal flocculation and any deviation from that point impacts operations, product quality, and manufacturing costs. In a variety of industries, flocculation processes are run in batch or continuous mode with either dynamic or static mixers. One of the key process parameters in both modes is the Mixing Zone Residence Time (MZRT). The point of optimal flocculation is located 1:38 min after flocculant injection. ParticleView shows that flocs have fully developed and floc breakage is about to become the predominant process. ParticleTrack trends in individual size classes visualize the point of optimal flocculation and define the MZRT-window in which the number of small particles reach an acceptable minimum. 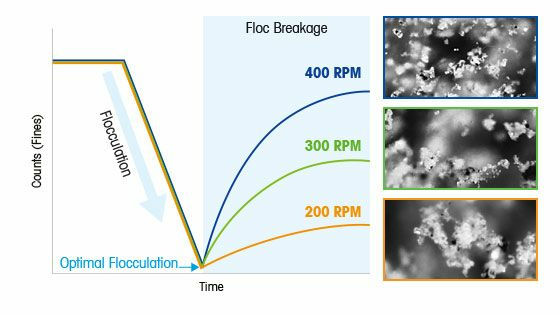 Operating outside the MZRT-window either means that flocs have not yet fully formed or floc breakage is already compromising floc size and optimal process performance. Both cases are suboptimal because of a high number of free small particles and only the MZRT-window ensures the desired product and process performance. The MZRT-window is different for each particle/flocculant system and needs adjustment depending on suspension composition, mixing intensity and flocculant type. How to Choose the Best Flocculant? Flocculant A shows a weak flocculation performance and is hardly able to reduce the amount of small particles in the system. Flocculant B captures a considerable quantity of small particles. However, flocculation kinetics are slow and the floc breakage rate beyond the point of optimal flocculation is high. Only Flocculant C shows a good overall performance with quick flocculation kinetics, almost complete capture of fines and an impressive floc stability beyond the point of optimal flocculation. ParticleTrack and ParticleView are able to monitor flocculation performance of different flocculants in situ and in real time. This enables scientists and engineers to make fact based decisions during flocculant selection and flocculation process optimization. 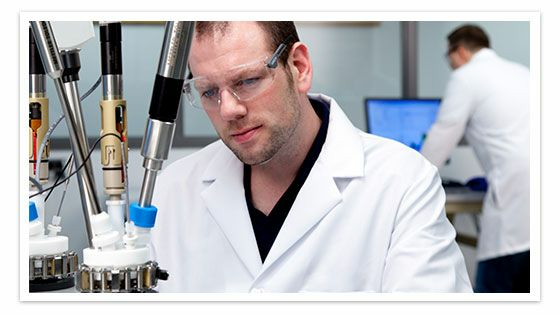 A Flocculation Workstation with PAT provides real time, in situ process data for immediate interpretation. Improve flocculation efficiency and apply floc specific mixing regimes to minimize floc breakage and avoid long filtration times. Below is a selection of flocculation publications.